Compressed air is a critical component of many electronic manufacturing processes, and Arrow Max can help you keep your air compressor, vacuum pumps & air dryers running at maximum efficiency. 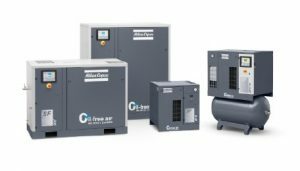 If clean, compressed, dry air is important to your electronic manufacturing process, we can help you select and install the right air compressor for your requirements. The professionals at Arrow Max Compressor & Pumps have over 20 years of proven industry experience working with compressed air and vacuum pump systems, and have worked on countless compressors, vacuum pumps and air dryers used for different types of electronic and semiconductor manufacturing. Working on all makes and models of air compressors, we have the experience to troubleshoot and repair compressed air systems used for electronics manufacturing. Air compressors are used in a variety of ways in the electronics manufacturing process. From cleaning components before they are packaged, to powering pneumatic machines, a steady supply of compressed air is essential to operations. Oil-free air compressors help provide a clean and consistent air supply required for the manufacturing process. Atlas Copco’s SF oil-free scroll compressors provide 100% oil-free for critical for electronics manufacturing. These ISO 8573-1 CLASS 0 certified compressors are easy to operate and maintain, and have a minimal footprint to save space in your facility. SF compressors eliminate the risks of oil contamination while providing an efficient, reliable and cost-effective source of pure oil-free air.